With the recent opening of the 55th International La Biennale di Venezia, Momas and Dadas holds a parallel pavilion of its own, gathering together a motley crew of young, ambitious and relatively unknown international artists selected by Matthew Couper to represent Las Vegas culture as a party in Hell. As a flipside from first-time biennale participant, Vatican City; DISCO INFERNO – from the far-flung underworld of Las Vegas – presents an exhibition of artworks which slovenly give into temptation, present low moral standards while having a damn fine time doing so. The gathered group of artists certainly promote an Encyclopedic Palace of the debauched. 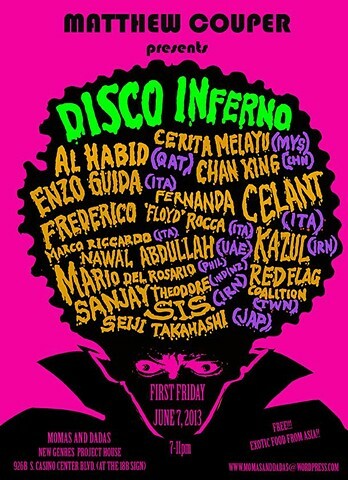 You are warmly welcome to attend DISCO INFERNO on Friday the 7th of June (First Friday) from 7pm – 11pm. 926b S. Casino Center Blvd.